Go for a custom slipcover but make it work for your budget. Below are 4 tips for saving money when it’s time to update your old sectional. 1. 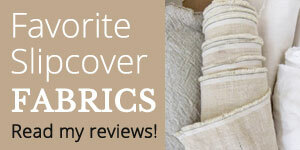 Look for a super deal on fabric. Sue’s sectional (image above) required 48 yards. Saving money on labor to cover the 3 large sections and 13 cushions wasn’t possible so she was determined to save on fabric. She found a durable, washable $3/yard cotton canvas, a factory seconds fabric from Big Duck Canvas. It was very good quality. I didn’t see one flaw on the entire lot. Her total cost for yardage including shipping was under $200. Talk about a super deal! 2. Detach the back cushions. Becky’s sectional (above) was one of those pieces that is configured and sized to fit her space perfectly. It is a keeper! The only downside: the back cushions were attached. Slipcovering attached back cushions adds quite a bit of extra labor cost to a project. Fortunately, Becky was fine with me detaching the pillow-style cushions and covering them individually. The loose cushions not only saved her money but also look and function better than the originals. 3. Omit the skirt and welt cord. When it comes to design details think about how you can simplify them to save money on your new slipcover. For example, attached skirts with pleats and welt bias strips can add several yards of fabric to a sectional project not to mention the extra labor cost. My customer’s linen cotton slipcover (above) has a tailored skirt and welt cord. It looks terrific. But it would have looked beautiful in a different way without those details. Remove the skirt, expose the legs (if they look good), and top stitch the seams. These types of simple design changes save money and give a traditional piece a style boost. 4. Copy your old slipcover yourself. This is the biggest money saving tip I have for you when it comes to replacing an existing sectional slipcover. I know it’s not for everyone. But if you can read and cut out a pattern and have basic sewing skills you can take apart your old slipcover and use it as template to make the new one. A DIY sectional slipcover project turns out best when your original cover is a simple design like the one above. Lots of rectangles, nothing fancy. You will also need to choose a fabric weight that your home sewing machine can handle as it sews through multiple layers. I recommend 8 to 10 oz weights. Here are some of my favorites. Combine your free labor with my other 3 tips and you will save buckets of money on your new sectional cover. I love all your advice and I appreciate the time you take to give it. Most of all I love the photo examples. Thank you! Thanks Tracey! My intent is to inspire and educate via my blog. So glad you enjoy it!